Eddie the Eagle is the story of Eddie Edwards (played by Taron Egerton), a boy from England who has a dream to compete in the Olympics. Eddie tries all the summer Olympic sports and fails, which leads him to try winter Olympic sports and join a downhill skiing team. Eddie´s team gets into the Olympics, but the Olympic board says that Eddie wasn't accepted to compete with his team. So Eddie then moves on to Ski Jumping and goes to Germany to train in Ski Jumping. From there we meet Eddie’s coach Bronson Peary (played by Hugh Jackman), a washout Ski Jumper from America that helps Eddie Ski Jump. 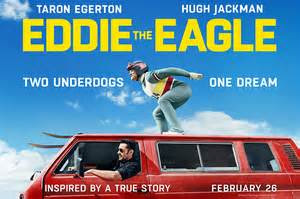 While Eddie the Eagle uses many clichés that have been seen in a lot of sports movies, it has good performances and heart that has you cheering for Eddie all the way through.